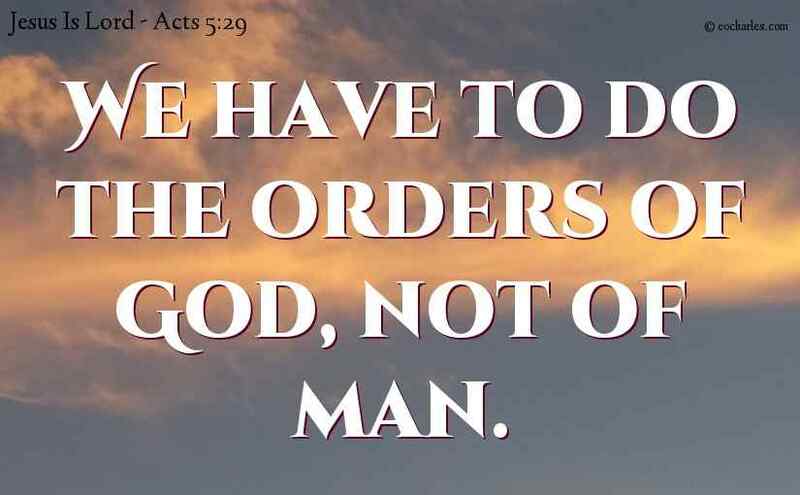 We have to do the orders of God, not of man. 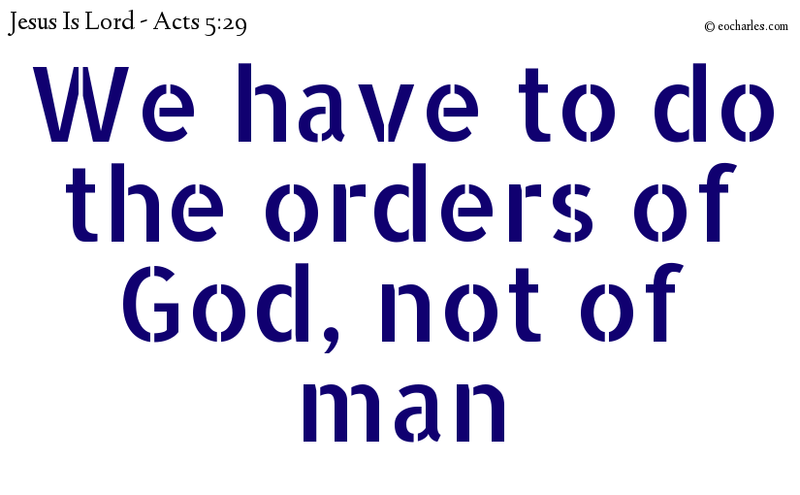 But Peter and the Apostles, answering, said, We have to do the orders of God, not of man. Continue reading We have to do the orders of God, not of man. The supremacy of God in all things. We must always obey God in all circumstances. 4)Act 4:19 But Peter and John answered and said unto them, Whether it be right in the sight of God to hearken unto you more than unto God, judge ye. There is one God, one Jesus, one Spirit, one truth. But sometimes, God makes known to us to not follow specific commands of the authorities set over us (or that we have submitted ourselves to). In that case, we must submit to God, and only to God. The authority of man is nothing compared to the Supreme Authority Of God Almighty. 5)Psa 118:8 It is better to trust in the LORD than to trust in people. Thank You For Providing Jesus, The Only Perfect Lamb. Thank You For Healing Me From The Inside Out. Thank You For Lifting Me Up When I’m Discouraged. Thank You For Cleansing Me From My Iniquities. Thank You For Revealing Yourself To Me And Being My Lord. Thank You For Being The Lord Of All. I Praise And Thank You In Jesus Name. 4. ↑ Act 4:19 But Peter and John answered and said unto them, Whether it be right in the sight of God to hearken unto you more than unto God, judge ye. 5. ↑ Psa 118:8 It is better to trust in the LORD than to trust in people. Act 5:29 But Peter and the apostles answered, We must obey God rather than men. Have No Fear Of Man, And Always Obey God. And Keep On Obeying Him So He Can Fill You With The Holy Spirit. And All The Blessings He Has Laid Out for You. For Showing Me How You Have Ordered My Steps. I Submit To You God, And Obey Your Will. I Forgive Every Sin And Trespass Against Me. I Thank You LORD, For Your Daily Blessings. Let The Holy Spirit Increase, Everywhere.